The week off from school and work hadn’t gone as we had hoped. We wanted temperatures in the mid-60s, blue skies, the garden soil dry enough for planting. The hammock, the bikes, the dinners outdoors. The erasure of a brutal winter, and the sense that life was about to get much better. What we got instead was temperatures in the mid-40s, rain, some sleet, some snow, the garden sodden and dispirited. Another week spent indoors after a winter full of such weeks. So we headed to the coast, to Portland, Maine, where we hoped it might be warmer. And if hope failed this time, there were some things we could count on: hipster craft shops, good restaurants, and – the biggest draw for our nine-year-old – a swimming pool at the hotel. Already she’s a better swimmer than I was at that age, and well on her way to being a better swimmer than I am now. 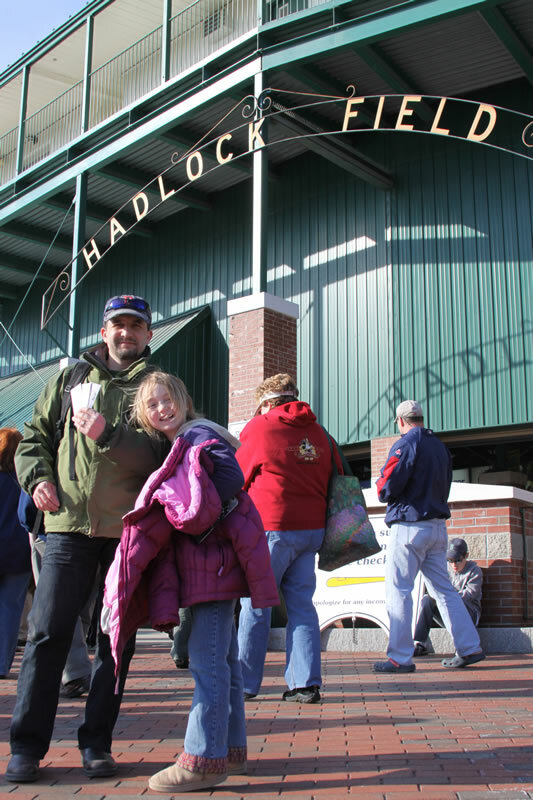 I also hoped to get to see the Portland Sea Dogs, the Double-A affiliate of the Red Sox. 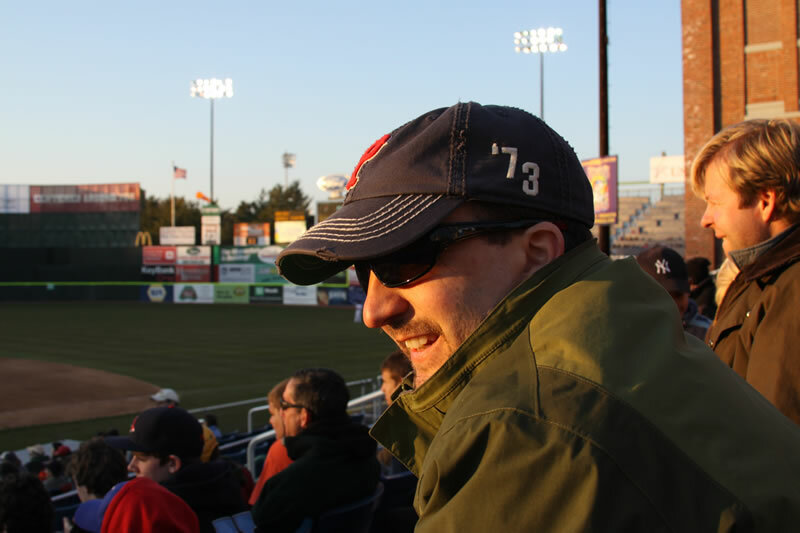 I wanted to revisit Hadlock Field, where I had experienced a Perfect Moment last summer, and which stands in a dead heat with Reading, PA as my favorite place to see a ballgame. If the weather gods smiled upon us, I thought, I could possibly take in two games, one on Thursday night, and the other on Friday. We could leave right after the game on Friday night. The Sox were on the West Coast and I could listen to the 10:05 radio broadcast as I pulled the late shift on the three-hour drive home. Friday was much nicer, and although we had done all kinds of great small-city stuff throughout the day, I realized by 5:00 that few things make me as happy as pulling into a parking lot outside of a baseball stadium on game night. The smoke billowing from the concession stands, the kids skipping down the sidewalk, the old guys selling programs with a practiced barker’s call, the smell of hot dogs and beer and fried dough. I was so excited that I made a tactical error, and bought seats along the third-base line, which turned out to be in the shade. My wife – happy to see me happy – was gracious, and said that they were fine. I took the kid down to buy a cheeseburger and a soft pretzel, returned to the seats to page through my Prospect Handbook, and tried to temper my regret. I wanted this evening to be perfect, the way I had wanted our week off from work to be perfect. My job requires me to be on top of a dizzying amount of details, and fully indulging the Type-A parts of my personality at work has bled over into other areas of my life, even down to plotting out my days off. But I’m learning that you can’t control everything, and that a big part of life is dealing with the sodden weeks, the days when the hammock can’t be hung, the evenings when you shiver in the stands, even though you want nothing more than to have summer arrive and watch the ballplayers turn two with acrobatic grace out on the green grass. And if you’ve spent a week doing errands and listening to your daughter’s stories indoors with what you hope is patience and appreciation, instead of standing barefoot in the warm soil of your garden – which is what you really wanted to be doing – perhaps fortune will smile down upon you. 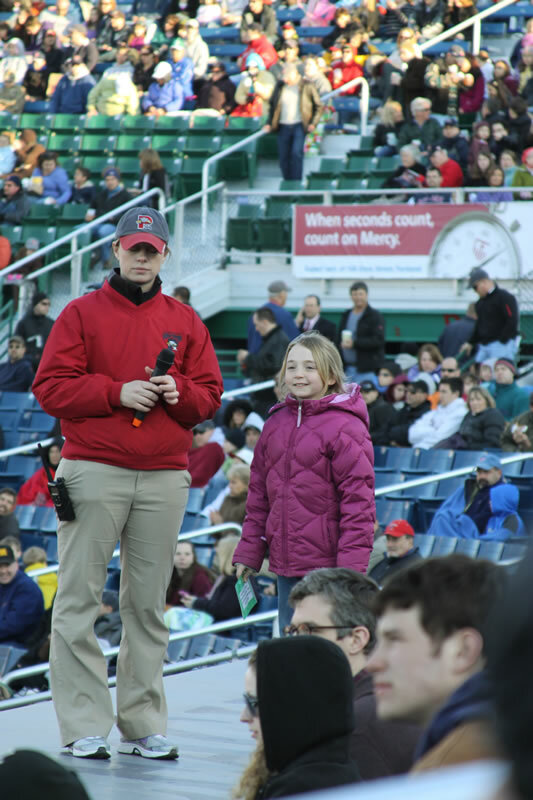 One of things I’ve enjoyed about seeing so many minor league games is understanding the jobs of the various people who work at the ballparks. There are the ushers, of course, and the crusty guys selling the programs, and the teenagers manning the concessions, their freckled faces glistening with a mixture of sweat and hamburger grease. 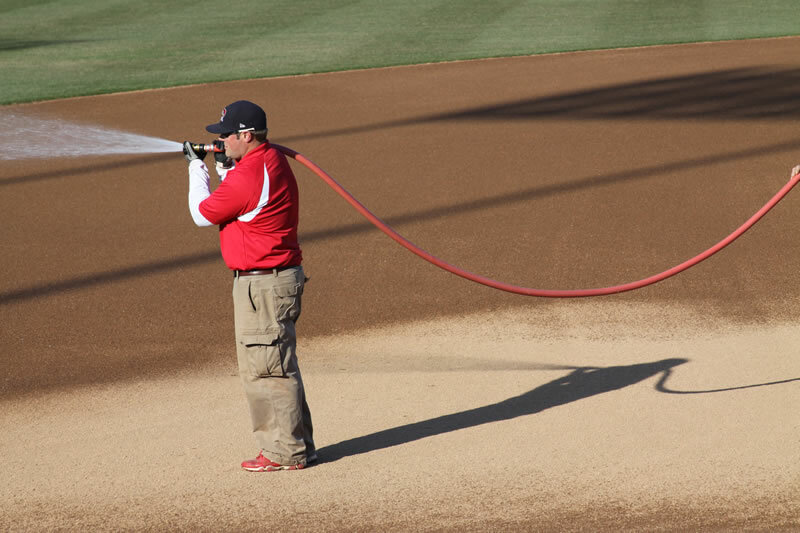 There are the guys who rake the field, and spray it down between batting practice and the first pitch, and who zoom around in John Deere Gators, always hurrying somewhere important. And there are three or four people – usually in their mid-twenties – whose job it is to make sure that everyone is having a good time. The standard uniform for these folks is ballcap, knit polo shirt with the team logo on the breast, and khakis with a walkie-talkie hung from the belt. One of these folks – Creighton was his name – slid into the row in front of us, 20 minutes before the first pitch, gave our daughter a big grin, and asked if she’d ever heard of Funtown Splashtown. She hadn’t, so Creighton filled us in. It’s a water park in nearby Saco, Maine. Our daughter perked up: Did somebody say water park? Apparently, Funtown Splashtown has a memorable jingle, probably similar to the one I used to hear for Dutch Wonderland when I watched Phillies games 35 years ago. (“It’s fun to go to Dutch Wonderland, Dutch Wonderland…”) If our daughter was willing to stand up on the dugout with Creighton in the middle of the second inning, and sing the jingle, she could win a free pass to Funtown Splashtown. Provided she sang better than the *other* girl who would stand on the dugout at the same time, and sing her version of the jingle. I already said that our daughter is a better swimmer than I was at her age. My parents both grew up on farms, and did precious little swimming as kids. Dad could do an undignified doggie paddle. Mom – whose only exposure to water-based entertainment was the “crick” that ran through their strawberry field – never could swim at all, and so we kids just kind of flailed around and picked up what we could. That’s not all that has changed between generations. When I was nine years old, you’d have to offer me the chance to live with Mike Schmidt for a year to even get me to *think* about standing on a dugout and singing a jingle, with a stadium full of people watching. And even then, I would probably pass. The chance for embarrassment was too great, and the single most important Lancaster County Mennonite lesson – Don’t draw attention to yourself – had already been fully cemented into my makeup. I wanted to tell Creighton, Hey, thanks, but find a local kid. Find somebody without an Anabaptist heritage. But our daughter, who goes to a small rural public school where the quarterly plays are as well-attended as the basketball games, eagerly agreed. She studied the laminated paper with the words to the jingle, asked me what “the middle of the second inning” meant, and headed off with her mother and another usher – Liz – at the bottom of the first to practice. And when the time came, she ascended to the dugout roof beside Liz, and watched with a poised smile on her face as the other girl sang. The girl got a big hand for knowing the jingle, and then it was our daughter’s turn. Now, we’re almost certain we won’t have any other kids. And our daughter, strong swimmer and ice-skater though she is, hasn’t shown much interest in team sports. A couple of times a year we kick a soccer ball around our sloping lawn, and I have, once or twice, pitched a Wiffle ball to her as she stood with a big red plastic bat at the ready, the house as a backstop. I’ve accepted that I won’t crouch down with my Rawlings glove as my offspring flings the ball to me, pitcher to my catcher. That we won’t take the Subaru – five-gallon bucket of baseballs rattling in the back seat – down to the ballfield behind the school, where I will remind him or her to stay down on the ball, and compliment his or her backhand, as I smash ball after ball toward the shortstop position. But I will admit that this knowledge has brought me some sadness, a melancholic reminder that life is fleeting, and that I am getting old, and that it’s probably too late for me to become a good swimmer, or live in a cool city like Portland and run a hip bike shop, or front my own band. All of the things that I could have been, but never became, bring me sadness until I see our daughter doing something with aplomb that I would never have done at her age. Namely, read a jingle with conviction and verve, before a minor league stadium of baseball fans, and bask in the applause, and come walking back to our seat with a gift certificate to a water park in her hands. And for those of you who don’t have kids, I apologize. I know you’ve heard this before, and you’re tired of parents like me complaining about how hard it is to even go to a city with a kid, because you need to balance going to ballgames with a trip to the Children’s Museum, that you need to negotiate a Thai dinner with a trip to a pizzeria, because the Thai food “smells spicy.” You’re probably tired of hearing how a week off from work isn’t really a week off, not when school is closed as well and it’s sleeting and your daughter has filled all of her composition books with stories and doesn’t want to just use notebook paper, because then it isn’t a *book,* and all you want to do is take a long nap, but you must suggest playing a round of Horse Show instead, to get her off the book idea. You’re probably saying that there is ample evidence that we knew what we were getting into, that if going to artsy stores or eating in hip restaurants or watching baseball games uninterrupted by potty breaks was so important to us, we never should have had a kid. And you’re right. You’re right, you’re right, you’re right. But I never could have anticipated the way I would feel when I wanted to leave the game in the fifth inning, because we were freezing, and we had a long drive ahead of us, and my daughter whined to stay longer, because she was having such a good time. It was a feeling that we discovered when we took our daughter to Ireland when she was four years old, a place that we had visited as a couple several times already, and loved so much that it had become a touchstone in our relationship. On that trip with our daughter, we found that showing her the things and places that we loved – the brown bread, the deserted beaches on Achill Island, the primary colors of the houses – added another dimension to that love. It was actually *more* fun to have a kid along, because we could see things through her eyes, and could share the good things about life with a person so willing to learn. As we left Hadlock Field and walked to our car, we approached a paint-peeling Cape with a bay window, half a block from the stadium. We heard the bass first, and then the drums. As we turned the corner, we could see a band clustered together in the living room of the green house. They had a mic stand set up, and the left-handed guitarist was singing into the mic, and my wife and I looked at each other. They’re good. I was touched by how close the band members stood to each other, perhaps to hear the notes better, perhaps to better pass signals about tempo and chord changes. It was like the way ballplayers, late in the year, once they are fully comfortable with each other, will help each other stretch before the game, unconscious about their togetherness. Hey, I said to our daughter as we opened the car doors. Maybe someday you’ll be in a band, in college. Maybe you’ll play with a group of your friends like that. And then, silently: maybe someday you’ll remember these games, even though it’s far more likely that you’ll be in a band instead of loving baseball, far more likely that you’ll become a theater chick instead of a jockette. Maybe someday you’ll remember how you stood on a dugout, unafraid, and how your parents were there watching you, and you knew that your dad was happy, whether you won a gift certificate or not, because baseball was something that he loved. And you knew that he loved you as well. So glad to see that you are back on the journey of minor league baseball. I’m trying to figure out when my first game will be – timing is a bit different now that I have a baby girl in my life. I’m looking forward to continuing to follow your incredible writing. Fortunately she’s a great sleeper. She slept through the night almost all the way through her first year. She has started getting up pretty early – around 6am – but I count my blessings that she doesn’t get up much through the night. Beautiful writing! And your daughter looks exactly like Sue did at that age.